Biomass heating has become very popular among modern home owners. The popularity is mainly on account of scope to save on energy cost. Biomass is secured from living organisms such as plants. It can be used in different ways. There can be a biomass plant where biomass is converted into fuel (such as methane gas, ethanol and bio diesel). These are com busted to generate heat. The second method is more popular. The most common source of biomass is wood. Wood is converted into into pellets or wood chips. Burning biomass releases heat which can then be utilized to heat homes. Biomass can be used to warm up a single room as well as to power central heating and hot water. 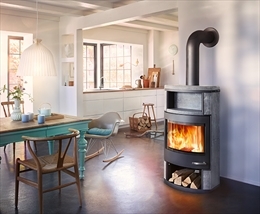 You can have a stove that burns logs or pellets to heat a single room. It can be fitted with a back boiler to provide water heating as well. A boiler burning logs, pellets or chips can be used to power a central heating and hot water system. Using biomass to heat homes can cut down fuel cost to great extent. •	Although prices of wood as fuel are increasing, it is still more cost effective than other fuels. Prices of traditional fuels like oil and gas are steadily increasing. Biomass as a fuel would not see this trend. The prices are quite stable and you will not see a sharp rise in fuel cost. •	Reducing carbon footprint has become a catchword of modern life. You may think that burning biomass would produce carbon too. Here there is a difference. The carbon dioxide emitted in this case is same as what was absorbed by the plant over the months and years when it was growing. The process becomes sustainable if the new plants were planted in place of those used for fuel. •	Again manufacturing and transportation of fuel leads to carbon emissions. But if the fuel is sourced locally then the emission rates will be lower compared to fossil fuels. Over all biomass is cleaner fuel than its fossil counterparts. Biomass fuel releases contemporary carbon, whereas fossil fuel releases fossilized carbon. If you use biomass fuels such as pellets they tend to be smokeless. •	Moreover, rising demand of biomass, would lead to better woodland management. This will be congenial for wildlife and biodiversity. Wood, if left to rot would generate both carbon dioxide (CO2.) and methane. The latter is a harmful greenhouse gas that is 21 times more potent than CO2. 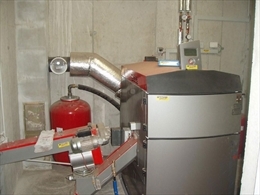 •	Biomass boilers are more bulky than gas furnaces as they are larger. You will also more need to space to store the fuel as such as a hopper or wood store. •	The initial investment in installing a biomass boiler is more compared to gas and electric furnace. •	Biomass fuel should be dry to burn efficiently. •	Biomass stoves need continuous supply of pellets or chips, unless you use a hopper. It amounts to some work on the part of the user. •	Biomass boilers need to be cleaned regularly. This is because a lot of mess is created due to the burning of fuels. You should clean it, around once a week. •	You should find a supplier of fuel as close to you as possible to reduce the carbon footprint and the cost of the delivery.